Posted on Wednesday, August 24th, 2016 at 9:04 pm. J-1 participants attend the Weaving Watersheds project, a community-based Interactive, impermanent art experience. In south central Alaska, the fishing community of Cordova cares so deeply about our oceans that you can’t escape the theme for even an hour while in town. 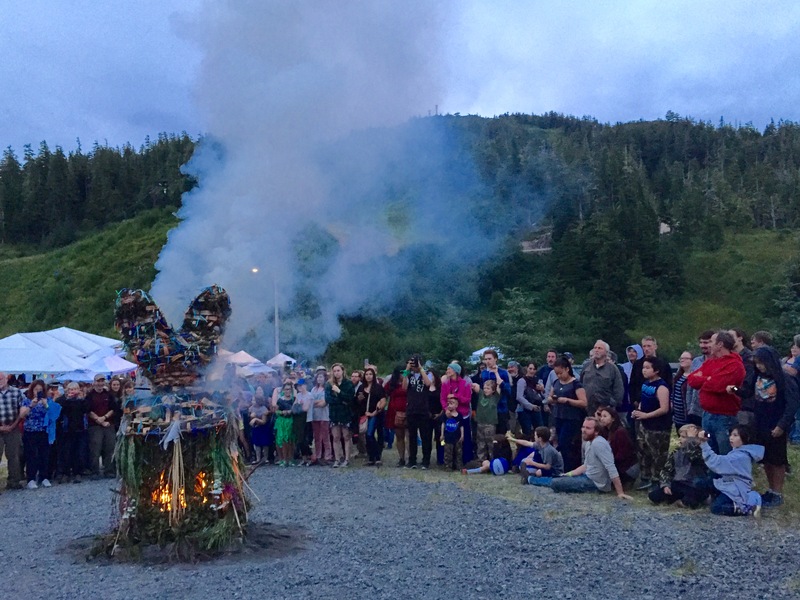 A number of Summer Work Travel participants are also there this summer, experiencing Alaskan culture in this community tucked between the Prince William Sound and the Copper River watershed. “Our Ocean” is an initiative led by Secretary of State John Kerry to raise awareness about ocean-related issues around the world, such as marine pollution and sustainable fishing. At Greenheart International, we believe in the importance of protecting all parts of our environment – so this is an initiative we are excited about! Recently, artist activist Mavis Muller visited Cordova on her Weaving Watersheds tour. Mavis weaves large baskets using materials she collects from local watersheds as a means to spread awareness about protecting our oceans. 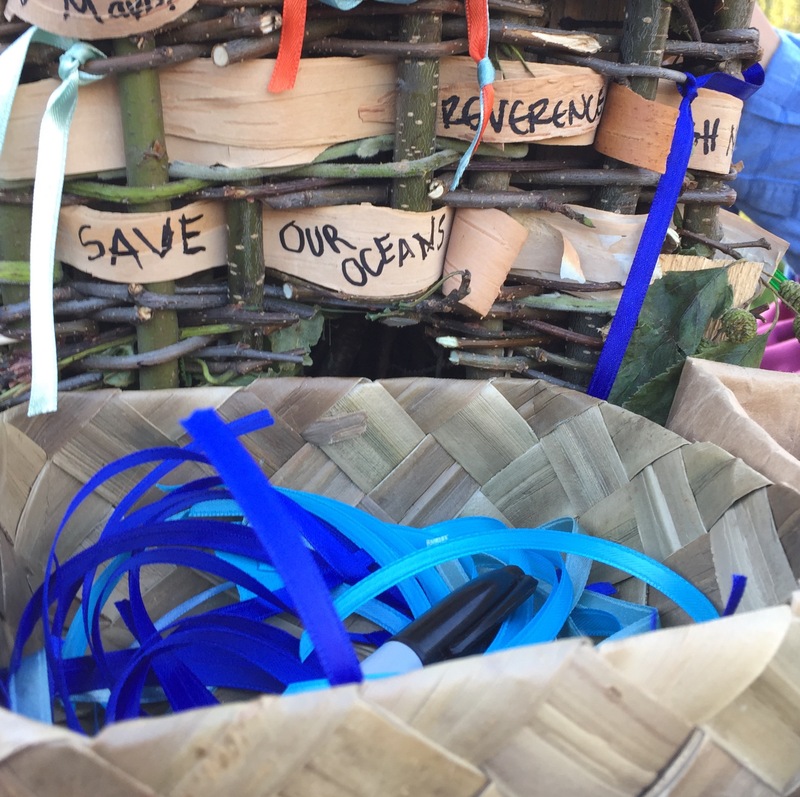 She invites community members to write intentions about preserving clean water and marine life, then ties ribbons of solidarity on the basket before lighting it aflame in a ceremony. “Our Oceans” was written on one of these baskets in honor of Secretary Kerry’s initiative. Ribbons of Solidarity used by community members to write their intentions to preserve clean water and marine life. And shortly thereafter, that basket was burned following the shootings and national tragedy in Orlando, Florida. Participants and community members gathered to honor the shooting victims. The circle of people, composed of people of all ages and races, was a powerful reminder that we are all global citizens of one planet. Weeks after this event, Summer Work Travel participants in Cordova gathered again to learn about our oceans during J Day. Participants toured the Prince William Sound Science Center, where they learned about salmon’s impact on the community. They were then given the opportunity to assist American and Russian biologists in a portable marine research station currently residing on the Cordova harbor dock. J-1 exchange visitors tour Prince William Sound Science Center on J Day. At the station, participants saw how sockeye salmon fat content samples will be analyzed as part of a study looking at the decrease in salmon size since the 1970s. 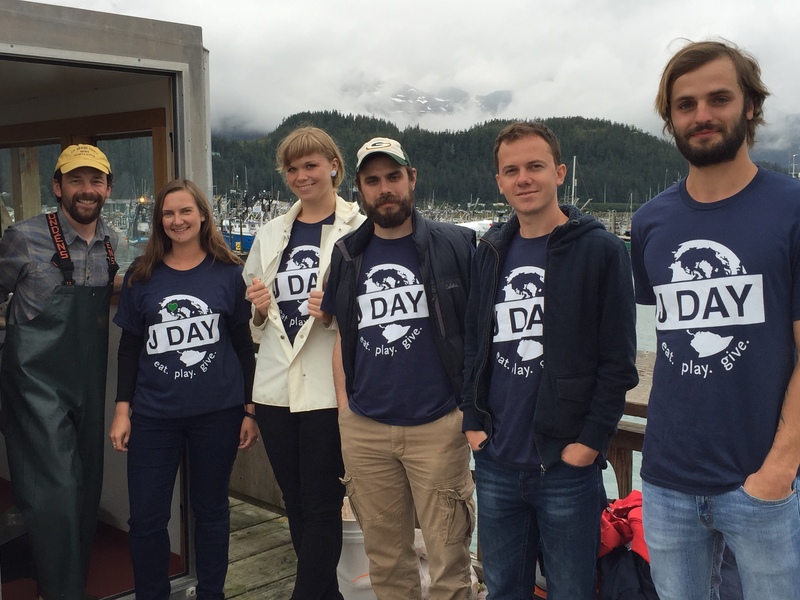 The volunteers were amazed to learn more about the incredible fish that are truly the lifeblood of Cordova and an integral part of our oceans.